Lithium-ion batteries commonly used in consumer electronics are notorious for bursting into flame when damaged or improperly packaged. These incidents occasionally have grave consequences, including burns, house fires and at least one plane crash. Inspired by the weird behavior of some liquids that solidify on impact, researchers have developed a practical and inexpensive way to help prevent these fires. They will present their results today at the 256th National Meeting & Exposition of the American Chemical Society (ACS). "In a lithium-ion battery, a thin piece of plastic separates the two electrodes," Gabriel Veith, Ph.D., says. "If the battery is damaged and the plastic layer fails, the electrodes can come into contact and cause the battery's liquid electrolyte to catch fire." To make these batteries safer, some researchers instead use a nonflammable, solid electrolyte. But these solid-state batteries require significant retooling of the current production process, Veith says. As an alternative, his team mixes an additive into the conventional electrolyte to create an impact-resistant electrolyte. It solidifies when hit, preventing the electrodes from touching if the battery is damaged during a fall or crash. If the electrodes don't touch each other, the battery doesn't catch fire. Even better, incorporating the additive would require only minor adjustments to the conventional battery manufacturing process. The project's eureka moment came when Veith and his kids were playing with a mix of cornstarch and water known as oobleck. "If you put the mixture on a cookie tray, it flows like a liquid until you start poking it, and then it becomes a solid," says Veith, who is based at Oak Ridge National Laboratory and is the project's principal investigator. After the pressure is removed, the substance liquefies again. Veith realized he could exploit this reversible "shear thickening" behavior to make batteries safer. This characteristic depends on a colloid, which is a suspension of tiny, solid particles in a liquid. In the case of oobleck, the colloid consists of cornstarch particles suspended in water. 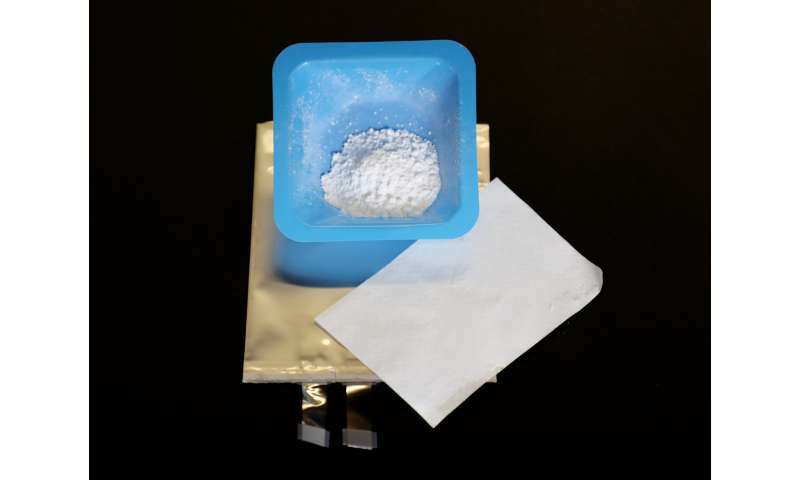 For the battery colloid, Veith and his colleagues at Oak Ridge and the University of Rochester used silica suspended in common liquid electrolytes for lithium-ion batteries. On impact, the silica particles clump together and block the flow of fluids and ions, he explains. The researchers used perfectly spherical, 200-nanometer-diameter particles of silica, or essentially a superfine sand. "If you have that very uniform particle size, the particles disperse homogeneously in the electrolyte, and it works wonderfully," Veith says. "If they're not homogenously sized, then the liquid becomes less viscous on impact, and that's bad." A few other labs have been studying shear thickening to make batteries safer. One team previously reported on research with "fumed" silica, which consists of tiny irregular particles of silica. Another group recently reported on the effect of using rod-shaped silica particles. Veith thinks his spherical particles might be easier to make than the rod-shaped silica and have a faster response and more stopping power on impact than fumed silica. One of Veith's major advances involves the production process for the batteries. During manufacture of traditional lithium-ion batteries, an electrolyte is squirted into the battery case at the end of the production process, and then the battery is sealed. "You can't do that with a shear-thickening electrolyte because the minute you try to inject it, it solidifies," he says. The researchers solved this by putting the silica in place before adding the electrolyte. They are seeking a patent on their technique. In the future, Veith plans to enhance the system so the part of the battery that's damaged in a crash would remain solid, while the rest of the battery would go on working. The team is initially aiming for applications such as drone batteries, but they would eventually like to enter the automotive market. They also plan to make a bigger version of the battery, which would be capable of stopping a bullet. That could benefit soldiers, who often carry 20 pounds of body armor and 20 pounds of batteries when they're on a mission, Veith says. "The battery would function as their armor, and that would lighten the average soldier by about 20 pounds." More information: EXPIRE: Extremely Passive Impact Resistant Electrolytes, the 256th National Meeting & Exposition of the American Chemical Society (ACS). This presentation will detail electrolytes that undergo a liquid to solid transition upon impact. This concept reimagines the battery electrolyte from something to fear to something intrinsic to the safety of a battery. This chemistry is built from colloidal particles that pack within a well defined space. Upon shear the packing changes forming a solid-like material. The presentation will discuss this chemistry and the interfacial reactions that dominate its performance. How about the added mass of the silica particles? They take up space inside the battery, reducing energy and power density.